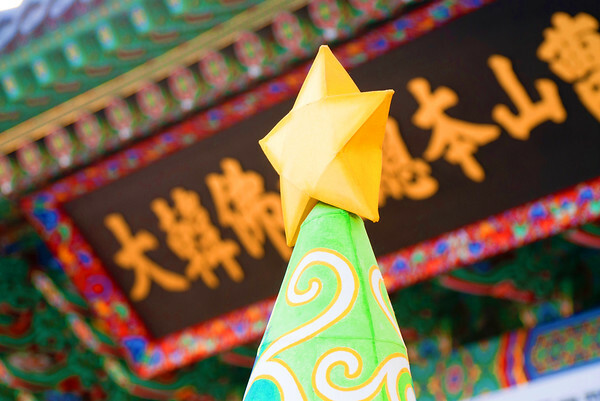 Sunday Photo; Christmas tree lantern at Jogye Temple – Wake Up and Laugh! This year, the head temple of the Jogye Order, in Seoul, put three Christmas tree lanterns by the street in front of the main gate into the temple. It’s a nice display of the friendship maintained between Jogye and the Catholic Church in Korea. Previous Post How can I become a more spiritual person? That’s brilliant! Thank you! Do you have any more shots of the trees on your photo site? I looked but can’t find them! All the best and thanks again – and Happy New Year! Edit: Just found them! Here! – Cho Kyu Hwan, director of Eunpyeong House of Angels, a child care facility operated by the Protestant church, to Jogye Order President Ven. Jaseung during his recent visit.